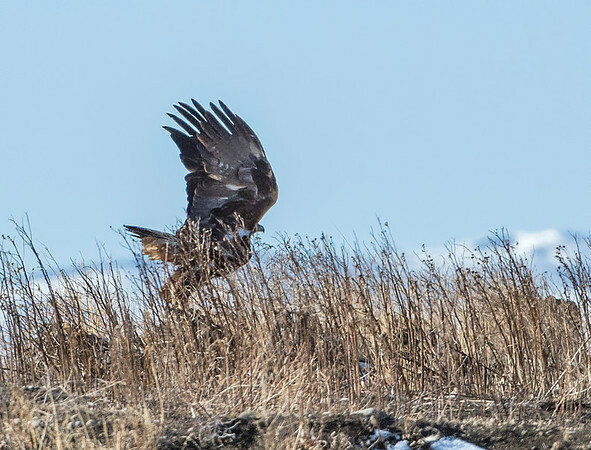 Late last week we went for a tour of Southwestern Alberta to find eagles. Over the day, we spotted 22 Bald Eagles and 16 Golden Eagles. We also spotted a Western Bluebird, a first in Alberta for me. Late in the afternoon, we spotted a Ferruginous Hawk and a Great Horned Owl sitting on a nest in a cliff. Included in this gallery are the first swans I have seen this year and a horned lark. It was a beautiful spring day and a great day for wildlife. WARNING: The last picture contains a somewhat gruesome picture of a deer carcass. While most of my pictures show the beauty of nature, this picture depicts the difficulties that wild animals face in their day to day survival. The migration of the eagles both bald and golden, is evident all along the foothills and further into the prairies. This Golden Eagle was one of 16 we saw that day.